U.S. Secretary of Defense Ashton Carter speaks with Adm. Sun Jianguo at the Shangri-La Dialogue. 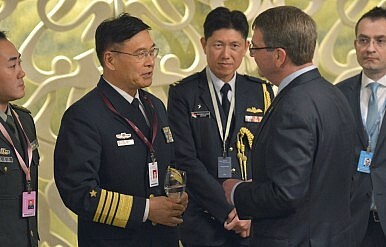 Will China's Top Shangri-La Delegate Be the Next PLA Navy Chief? Admiral Sun Jianguo, China’s representative at the annual security forum, may well become PLA Navy commander in 2017. Admiral Sun Jianguo, the head of the Chinese delegation to the Shangri-La Dialogue in Singapore and deputy chief of staff of the People’s Liberation Army (PLA), is very likely to become China’s next navy commander in 2017. He would be the right person with right credentials at the right time. First, he will be the most senior admiral in the PLA Navy after Admiral Wu Shengli, the current navy commander, retires. After the retirements of Admiral Tong Shiping (former deputy director of the General Political Department and secretary of the Central Military Commission Disciplinary Inspection Commission) in October 2012 and of Admiral Liu Xiaojiang (former political commissar of the PLA Navy) in December 2014, Admiral Sun and Admiral Wu are the only two officers left who can claim the PLAN’s highest rank. Born in August 1945, Wu will turn 70 in August 2015 and will have to retire in two years. Second, Sun has accumulated substantial military and political credentials. He joined the PLA Navy in 1968 and graduated from the Navy Submarine Institute of the PLA. He was captain of the PLA’s Long March III in 1985 when the submarine set a world record by spending 90 days underwater. He was deputy commander of a PLA submarine base in the late 1990s and was promoted to deputy chief of staff of the PLA Navy in 2000. He was further promoted to the chief of staff of the Navy in 2004 and was transferred to Beijing as assistant chief of staff of the General Staff Department. Following the career path of Admiral Wu Shengli, Sun was made deputy chief of staff of the PLA in 2009 and was awarded the rank of admiral in 2011. He was admitted to the 17th Central Committee as an alternate member in October 2007 and was elected a full member of the 18th Central Committee in November 2012. However, Sun will turn 65, the retirement age for a military regional chief, in February 2017. It is likely that he will have to retire then, but just as likely that he will be retained for further promotions, as General Fan Changlong (the current first vice chairman of the CMC) was in 2012. A native of Hebei, Sun happens to come from the same county (Wu Qiao County) as Wu Shengli. However, it is unlikely that they knew each other growing up. The son of Wu Xian (former vice governor of Zhejiang), Admiral Wu grew up in Hangzhou while his father was mayor and party secretary of the city. Likewise, as son of a former county party secretary, Sun was born in Ningbo, Zhejiang and attended the Zhenhai Middle School there. A possible promotion for Sun could have dividends. With a conciliatory tone, Sun has projected the image of a seasoned military diplomat in the otherwise confrontational environment of this year’s Shangri-La Dialogue. The Chinese representative's speech at the Shangri-La Dialogue is exactly what we expected.